The Essential Study Package is built with our Core study materials, this self-study package equips you with exam-focused tools needed to prepare for the CFA Program exam on your own. **Study materials are subject to availability. Delivery will take approximately 2 weeks if out of stock. ***On placing an order, please contact us on +971 4 554 6184 for order confirmation. The special rate for Kaplan Genesis current CFA prep students is AED 750. Please get in touch with our program advisors to claim this exclusive rate. 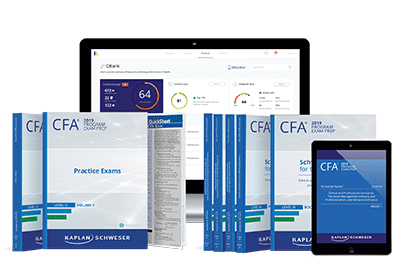 Prepare for the CFA Program exam with concise, clear, and comprehensive study notes and detailed examples that cover every required Learning Outcome Statement for the exam. Practice with exam-like questions and realistic self-tests designed to measure your progress. A quick printed and online reference of the must-know key formulas, definitions, and concepts of the curriculum. The printed QuickSheet is a 6-page, 8.5 x 11", laminated tri-fold. Each printed volume contains 2 full-length practice exams. that let you realistically test yourself. Included with your Practice Exams is access to the Online Performance Tracker, which allows you to compare your scores to other candidates who have taken the exams. With the SchweserPro™ QBank, you can quiz yourself with thousands of multiple-choice questions, build custom exams using the topics and the number of questions you select, view answer explanations and LOS summaries and be able to access your QBank online, with available offline access. This innovative tool takes the guesswork out of creating a prep plan! Prepare with a detailed study plan that shows you how to use your study materials in the most effective way possible. Connect with a CFA Program instructor for personal assistance anytime as you prepare for the exam. They are ready and willing to answer your exam- and content-related questions. This collection of online reference videos will prepare you for your studies with an introduction to the core concepts of the curriculum. Backed by learning science and innovative technology, Stanley tells you what you need to do and when you need to do it within Kaplan Schweser’s Study Program. *On placing an order, please contact us on +971 4 554 6184 for order confirmation.